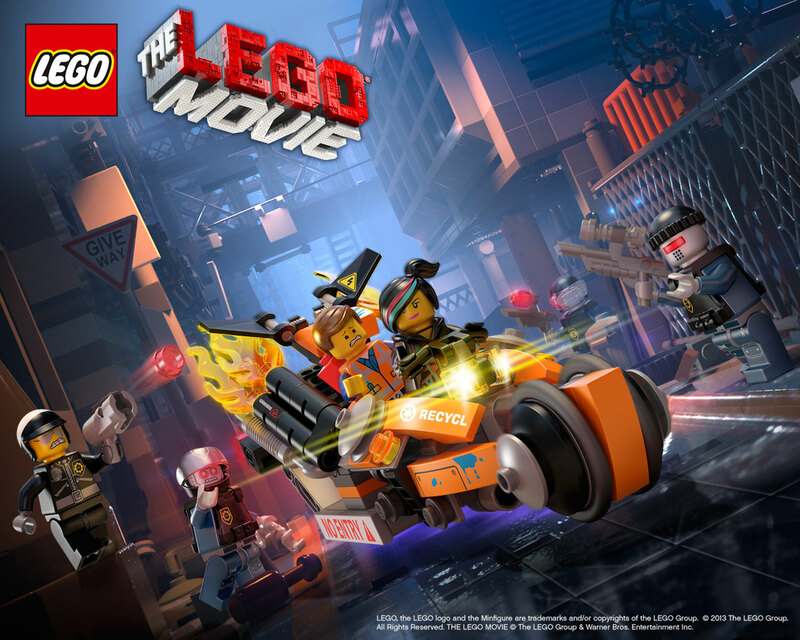 Unless you've been living under a big ugly rock piece you'll know that The LEGO® Movie is released in the US on February 7 (see all countries' release dates here). The tie-in sets are already on shelves for some of us, and these weird and wonderful sets are going to be reviewed over the next couple of weeks here on New Elementary, with a little help from my friends! I've invited a few UK builders to bring their voices to some of the reviews and first up we have Tim Goddard a.k.a. Rogue Bantha, co-author of LEGO Space: Building the Future . He's also contributed to DK Publishing's The LEGO Ideas Book and The LEGO Play Book , and you can generally coo over his cool Spacey talents over on Rogue Bantha's Flickr page. In the spirit of one of the central themes of the film - rebuilding - I've also set my team the awkward task of building an alternate model from their set. Hopefully this will transport you back to the good ol' days when LEGO sets came with alternate builds on the back of the box, a practice that was stopped after too many parents complained about the absence of instructions! Boo hiss, uncreative parents. You're the ones who spoilt it for everyone else. 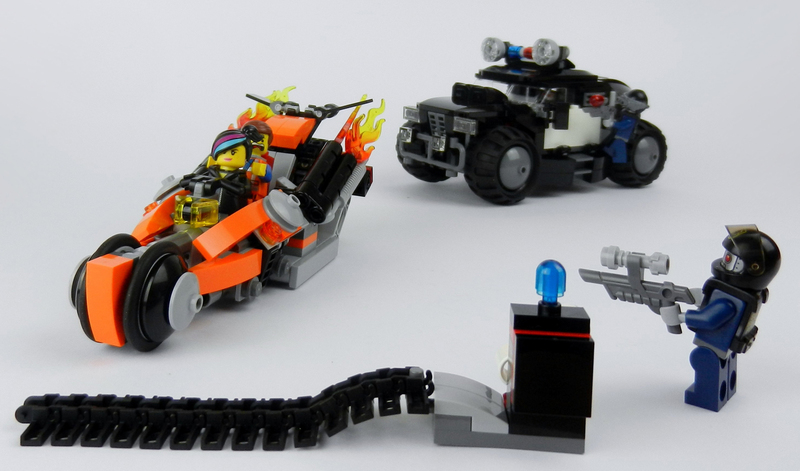 Now, over to Tim G.
Welcome to my review of set 70808 Super Cycle Chase. I’ll try not to ramble, but no promises. I may rant occasionally. 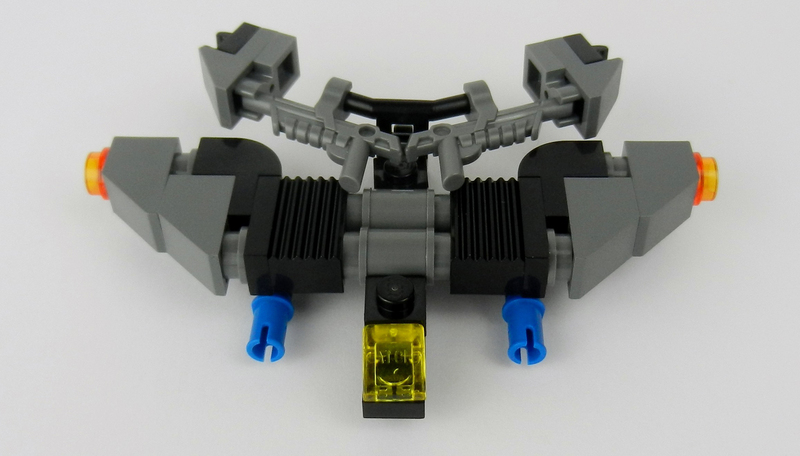 I may also have a leaning towards pieces useful in the kind of MOCs I personally build. One of the larger sets from the plethora just released to tie into The LEGO Movie, it comes in a nice big mostly empty box. It’s made up of an orange two wheeled thing for the heroes of the film to get away from a Humvey type police vehicle. It also contains an unrolling stinger. Right, I’m ready to start building. In a rebellious moment I choose to build on the sofa (in direct contravention of the instruction book), emptying out bag one of three on to my outstretched T-shirt. I immediately lose a minifig head down the back of the sofa and as I turn to retrieve it, a four-long bar falls on the floor. I transfer the parts to a plastic tray and continue. 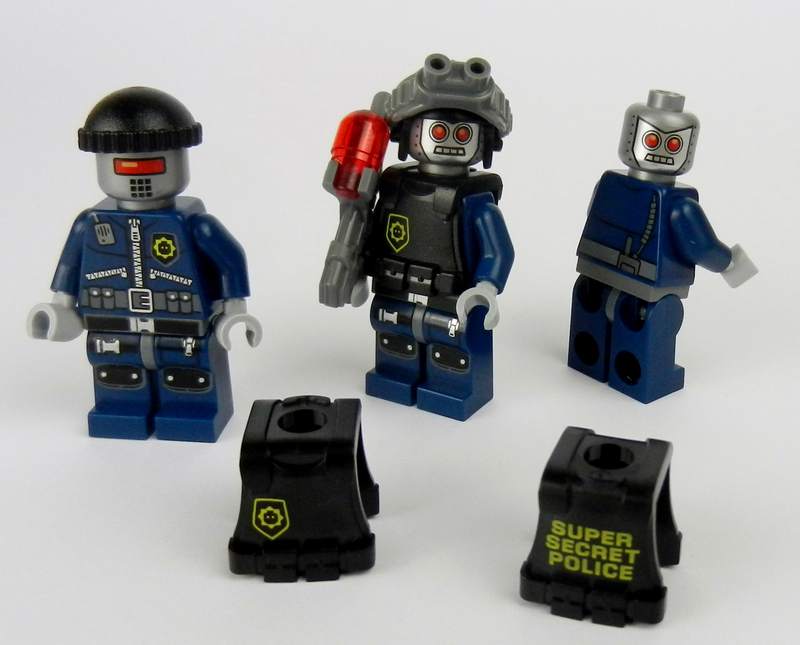 The figures are quite nice, the three robot swats certainly have customising potential. They come with a couple of new parts; firstly the new night visor goggles (Element ID: 6062648 | Design ID: 15446). I expect there are some modern warfare builders (MWFOLs?) who wet themselves when pictures of this piece first appeared. 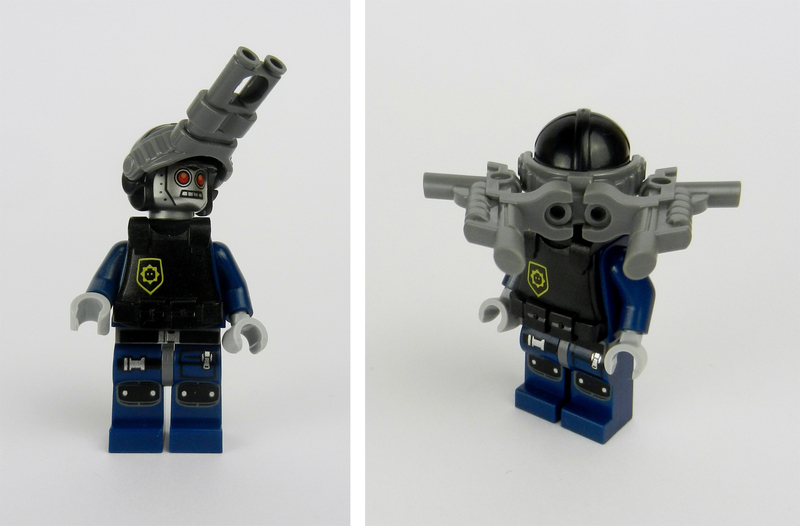 It follows a trend of the last few years where LEGO take some successful product ideas from the likes of BrickArms or common TFOL customs (cutting some binoculars and sticking them on a standard visor) that goes back to when Star Wars figures first came with blasters rather than a megaphone with an orange dot stuck on. This new piece is compatible with a pair of binoculars (not in set) to make super magnification goggles, and allows attachment to a standard clip (just). That new gun (Element ID: 6055607 | Design ID: 15445) is pretty nice. I get a bit excited about new guns as I tend to use them to make robots, and for general greebling. Normally they prove to be less useful than I first hope (the ray gun is a notable exception, I can’t get enough of them) but these guns will be quite useful I think. For a start they are Dark Bluish Gray [BL]/Dark Stone Grey [TLG] and not some weird pearl metallic colour that doesn’t match any other parts I have. Also they have plenty of attachment points without unhelpful bulges to get in the way. I’ve used them in an alternative set build which you can see later in this post. The other two figures are heroes Emmet and Wyldstyle. Emmet comes with his mysterious and much talked-about back pack (Element ID: 6055611 | Design ID: 15444). Unfortunately it only has a hole on one side so this reduces building potential. His hair is also new (Element ID: 6059258 | Design ID: 15443), with a little bit at the back that sticks up. I feel his pain as I also get that bit of hair sticking up first thing in the morning. Wyldstyle comes with a new hoodie piece (Element ID: 6062098 | Design ID: 88585) in soft plastic and new hair. Cue my next rant. Why do LEGO insist on having patterns that spread across torsos and legs? This makes it almost impossible to use the legs and torso separately. Now I know LEGO don’t want you to swap out arms and detach legs from hips in case the torso cracks or the legs become loose, but aren’t we allowed to change legs and torsos over? Grumble, grumble. Be mindful, the revenue-generating minifig is taking over. As is standard, the set has two instructions books. Just about every set over about £15 comes with two instruction books these days. This demonstrates that not only are LEGO sets becoming gradually bigger, they are also becoming more complex. When I actually fell within the age range recommended on the box, back in the mists of time, it was a big deal to get a book at all rather than just a folded bit of paper. 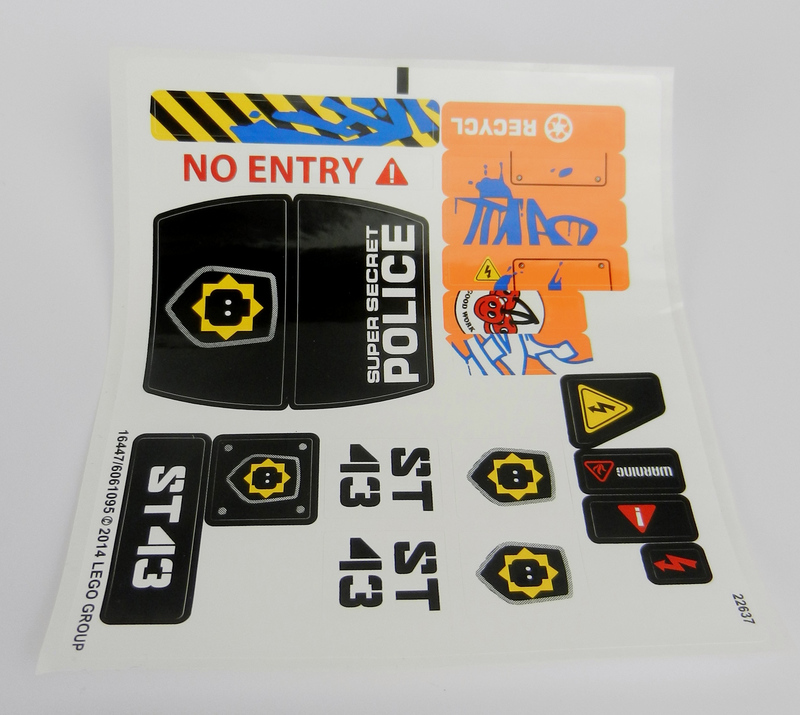 The set comes with a sheet of stickers; I’m not going to apply them so I can reuse the pieces but some of the stickers look like they might be useful on a MOC. I’ve put them in a folder containing stickers that may be useful one day (but that I rarely actually use). For some reason recycle is spelt ‘recycl’, this may be deliberate as the sticker is cut off after the ‘L’ but it seems a bit weird. I think this would have involved an illegal move not so long ago. The four long bar actually goes through the Technic wedge belt wheel. If I recall correctly, the plastic used to make bars is not the usual ABS and effectively sticks to some other plastics, making it very difficult to remove sometimes. There is no sticking here. 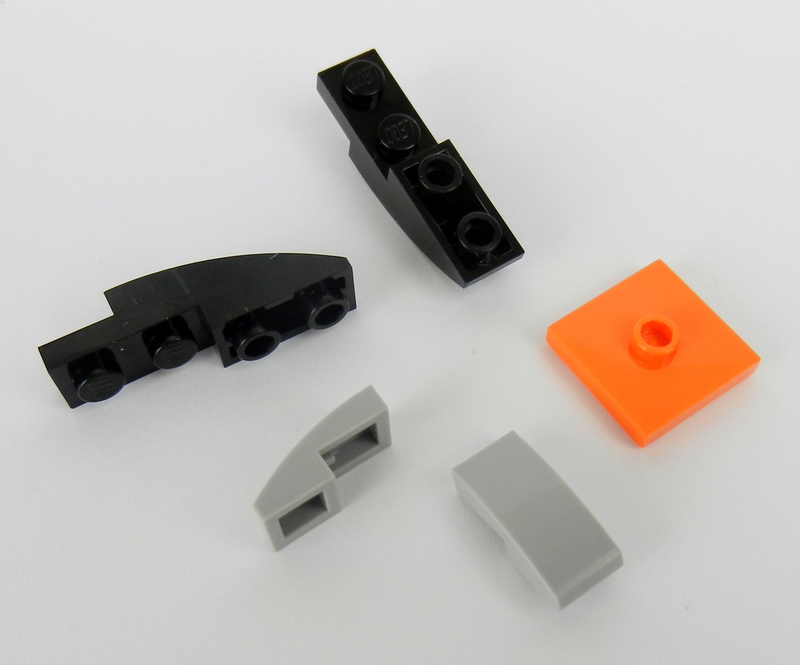 I suspect that LEGO have either changed the plastic used for some pieces or changed the geometry of some bits to make connection looser, or both. Hopefully they have realised that there is no point having rules that children don’t know about and have decided to do something about it. 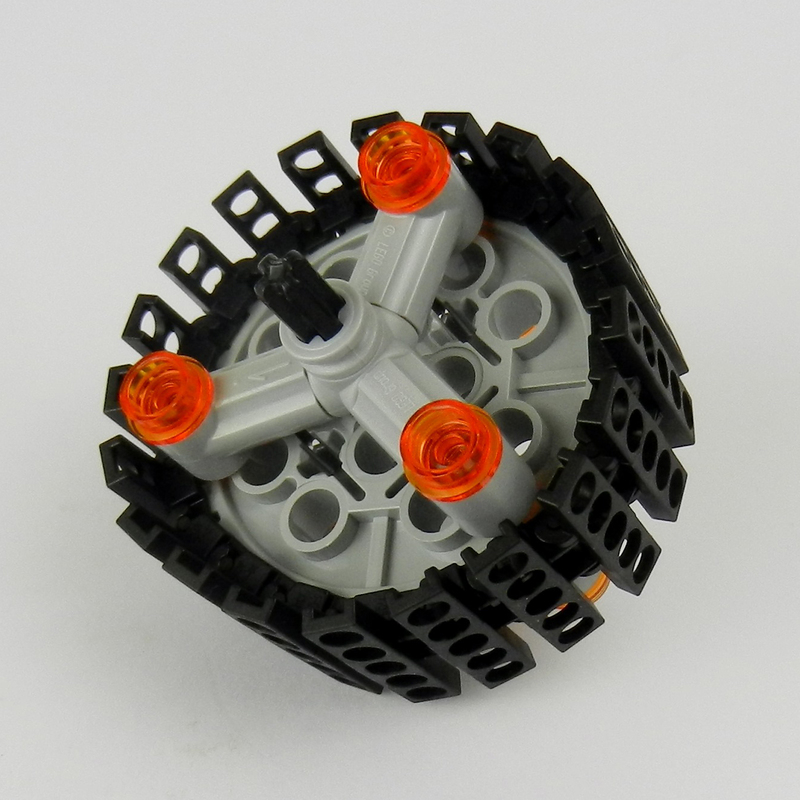 The back wheel also looks cool although the three spokes are just decorative. The use of tank tracks is welcome and makes the model feel nice and chunky when pushed along. The Humvey is not nearly so exciting, it’s pretty much a box with wheels. It’s not until towards the end when the curving pieces are added that it comes to life at all. The running plate folds up using a 4X4 plate with clips on each side to reveal a flick missile, the boot opens to hold some dynamite. The stinger works well as a play feature, with more of those welcome tank tracks. On to the (non-minifig related) elements; I’m afraid they're not quite as exciting as a Legend Beast. There is a 2X2 modified plate with one stud in orange (Element ID: 6013635 | Design ID: 87580) which is a first for this colour. The baby bow comes in Light Bluish Gray [BL]/Medium Stone Grey [TLG] (Element ID: 6028813 | Design ID: 11477) in this and several other 2014 sets. I hope to see baby bows in many colours this year. Not brand new but new to me are the curved 1X4 inverted slope in black (Element ID: 6039869 | Design ID: 13547) and the 4X4 Dark Bluish Gray plate with two clips (Element ID: 6039699 | Design ID: 11399), which are not thrilling but I can see how they are useful in sets; it avoids the need to secure clips to a large plate. The most rousing thing for me, and another exclusive for this set, is the three-long Light Bluish Gray bar (Element ID: 6064033 | Design ID: 87994). Although this is just a new colour, it's one I've wanted ever since this useful part first appeared in 2010. The exhaust pipe (Element ID: 6044706 | Design ID: 14682) is a new version of an old piece; the old ones have a pointy rather than a flat top. A hole has been added along the shaft as well. I preferred the old version without the ugly slot but maybe some unfortunate child impaled themself on the old pointy-ended version. I’m not going to give ratings because the New Elementary is above such arbitrary things, but in summary, as a parts monkey, I’m pretty happy with this set. There are few pieces that I’ll have to sort away into the ‘never going to use this brick’ box but a few more snotty pieces would have been welcome. It’s not a set I would have rushed out to buy but I can see it will have high play value and is good value overall. That’s about it apart from some alternative models that the slave-driving Tim Johnson has forced me to make. Warning: models may contain illegal connections. First, a flying micro model using the new guns. 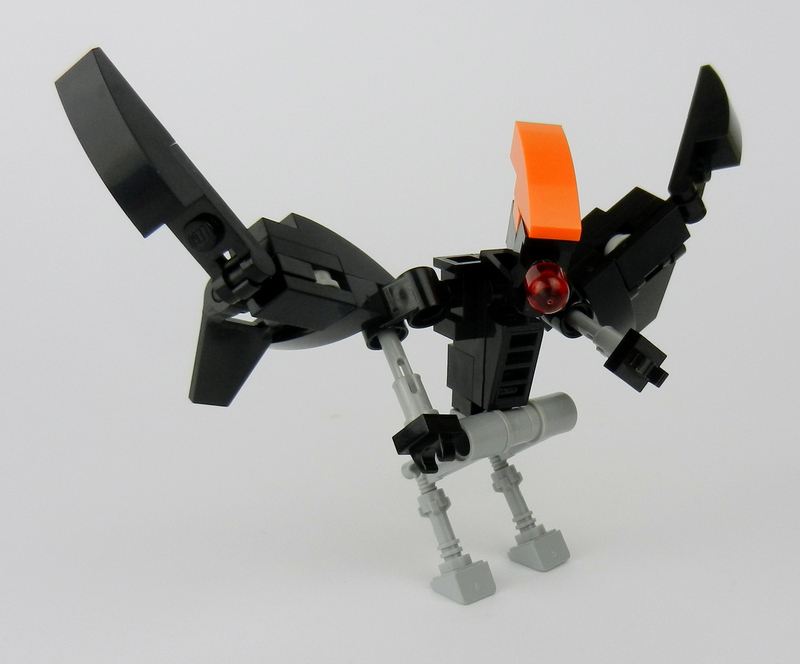 Second, the Crowbot. This did not start out trying to be a Blacktron robot. Third, something a bit bigger with wheels. This uses two of those 4X4 plates with clips. And finally, the duelling droids! 70808 Super Cycle Chase retails at US$49.99/GB£44.99. I believe only transparent bars are made from polycarbonate. Opaque bars such as the Light Bluish Gray [BL]/Medium Stone Grey [TLG] ones in this set are made of ABS, so that wheel construction is legal. You recall incorrectly. Lightsaber blades and shortsaber blades are made out of whatever plastic is standard for whatever color is used. For light-bley, that would be ABS. And polycarb doesn't "stick" to ABS, so I don't know what that's about. If it did, it would be because polycarb and ABS are reactive in contact with each other (like PVC and neoprene), and the parts would actually fuse together if left in prolonged contact. That would result in a mass desertion of the LEGO Consumer Affairs staff because that's all they would be getting calls about. Now, what might be happening there when a trans blade is pushed into an axle hole is that polycarb might not have as much give as the ABS part would, so an unintended connection like that could have a tighter fit. But they also changed the mold design for the lightsaber blade a while ago, so that might have affected fit as well. Actually, I'm not sure if this is still the case, but it USED to be that all lightsaber blades were made of polycarbonate regardless of color. I believe this was also true of cheese slopes in the first couple years after their introduction. And it's still true of all Hero Factory parts that include a ball cup. The issue with polycarbonate parts, as made famous by this presentation, is that they have an unusual amount of friction against other polycarbonate parts, not against ABS parts. Thus, it will be harder to separate a transparent 1x1 cone from a lightsaber blade than to separate a solid-colored cone from a lightsaber blade, and will sometimes even leave scratches in the pieces. However, this generally only applies to those kinds of incredibly tight connections. On a recent MOC I used some transparent 2x2 flowers on a transparent 1x1x4 aerial and there was no difficulty separating the parts afterwards. Likewise, as the presentation states, connections between a stud and an anti-stud don't tend to cause any issues regardless of material. The biggest PC on PC bummer I've encountered so far was in the Lunar Limo. Little cone eternally stuck on the end of the.. lego studios stick-puppet stick, or whatever it is. Aanchir, I just noticed that the Bright Purple cheese that forms Unikitty's ears are listed as being polycarbonate. Interesting (unless it is an error). I wonder if it is related to the colour... seems odd. You know you're an AFOL when... you're discussing a half-unicorn half-cat's polycarbonate cheese-shaped ears. Couldn't agree more about the printing across the entire minifigures body. So many almost perfect torsos . . .
Really enjoyed this review. Thanks Tim! 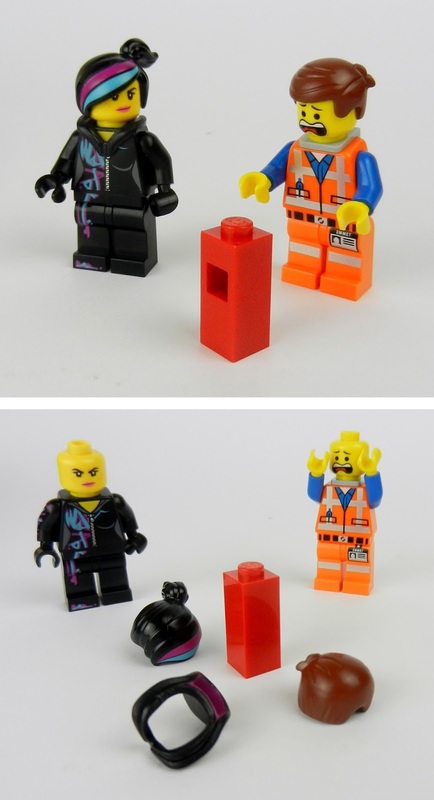 Regarding the rant ("Why do LEGO insist on having patterns that spread across torsos and legs?").... I have absolutely no idea how this pertains to this particular review. Considering the pattern on Wyldstyle's legs and torso are completely random lines and have no actual meaning, each piece can be used independently just as easily as they could be used together. Want to use Wyldstyle's torso as a simple sweater or hoodie, rather than a jumpsuit? You can! Want to use her pants as a simple pair of pants with an edgy pattern? You can! I know the issue you're talking about is a real (if often unavoidable) problem for designs where a shirt, jacket, or accessory hangs down below belt level and the shirt pattern has to be continued on the legs. But in this case, there's no issue at all. Overall, you did a good job covering this set, but instances like this bothered me. I'm used to AFOLs grumbling and I try to tolerate it. But grumbling about issues that don't really apply to this set at all, like the legs/torso issue or the tendency of some weapon pieces to be metallic colors, just makes the tone of the review seem a bit bitter, even when the perspective on the set itself is positive. Regarding the front wheel of the cycle: I don't think those 3x3 wheels have ever been made of polycarbonate, which is the kind of plastic that tends to cause the problem you're talking about, except when they are transparent. Transparent parts are almost always polycarbonate, hence why using transparent 1x1 cones with lightsaber blades is avoided in sets, but using opaque 1x1 cones with lightsaber blades is A-OK. I agree that the Humvee is rather boring. 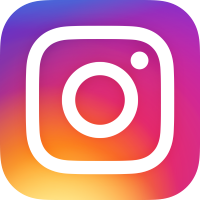 It's not that it's a bad design. 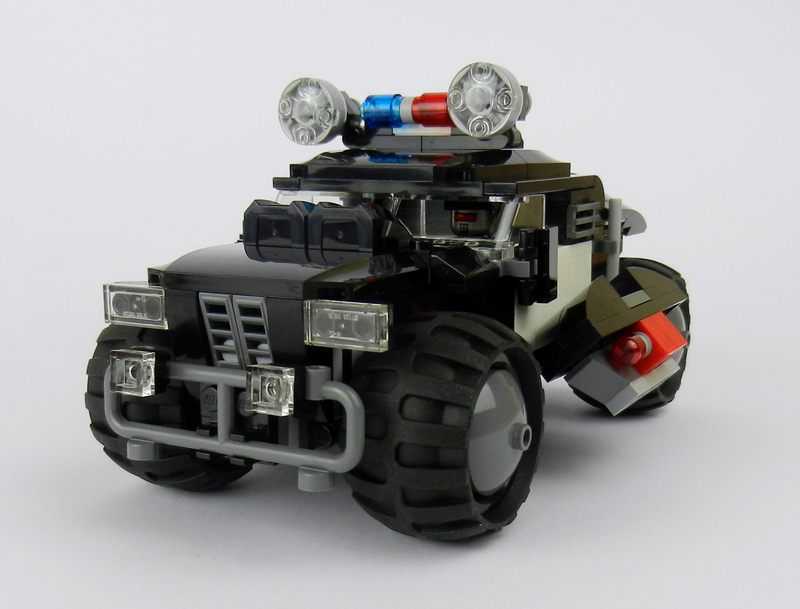 It's got great shaping and a really beefy look, much like the sets from a favorite theme of mine, LEGO Agents. But at the same time, I expect more play features in a model this size. 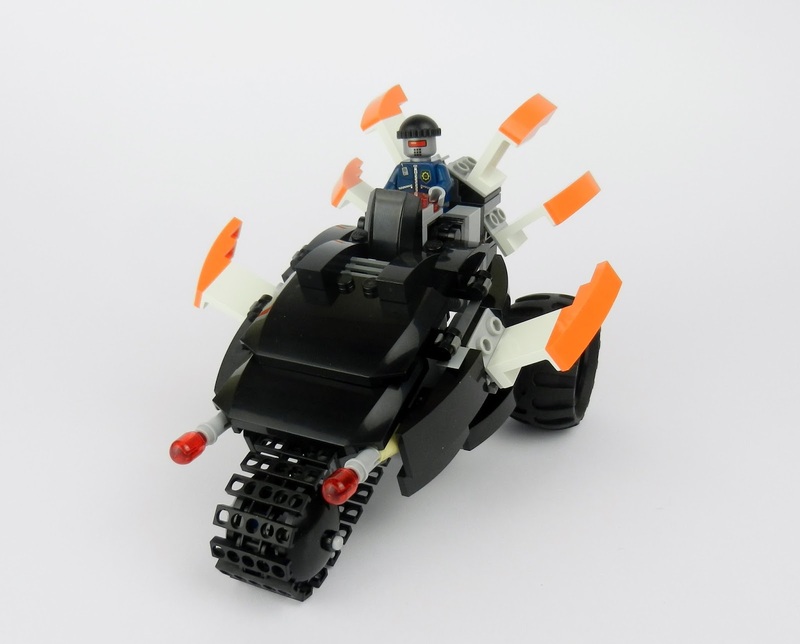 The Agents sets had no shortage of play features, while this just has a hatch and some difficult-to-reach flick missiles. I am glad you expressed appropriate excitement at the 3M shaft in a new color. It's one of those parts that's being recolored a lot in 2014 that nobody else seems to be making a big deal of. Fantastic piece there. Regarding the exhaust pipe, the groove in the back is a bit disappointing (well, when using it as an exhaust pipe — it just adds extra detail if you want to use it as generic greebling). That slot was actually added in a previous revision of the piece if I'm not mistaken. But I don't see the removal of the sharp point as a safety issue — after all, the edge of the crowbar piece is even sharper, and has been used for that very trait in the LEGO Games. Rather, I think it's to make the piece more versatile. The new one, unlike the old one, can be mounted shaft-first into a hollow stud. The redesign of the 1x1x4 aerial/antenna a couple years ago performed the same function, even though that part actually gained a sharper edge by flattening its previously round tip. On one final note, I don't see any illegal connections in your alternate builds, so if there are any, you managed to hide them well! Honestly, I don't think illegal connections in MOCs are something to be ashamed of, though it's up to each builder to determine whether they want to use them. It's one of those things that primarily applies to set design. Personally, I tend to embrace the challenge of designing something with only legal connections, because it means other people could build the same model with absolutely no reservations. But there are times when I'll use connections I tend to call "dubious" — parts held together in ways that probably don't damage the pieces, but that are almost certainly way too finicky to be approved in a set design! Good review of a good set! I'm already loving this post serie.. alternative builds from famous MOCer? Yes please!! Btw i purchased Lego Space: Building the future some months ago, and it rocks! One of your biggest sports on Earth now would be the underwater Mask sport scuba diving. regarding anyone brave souls who endeavor in order to wiggle directly into an wetsuit AND strap at an air tank, ones check out through beneath your waves can be very well worth your labor.